Gov. Peter Shumlin at a Statehouse press conference Tuesday. Gov. 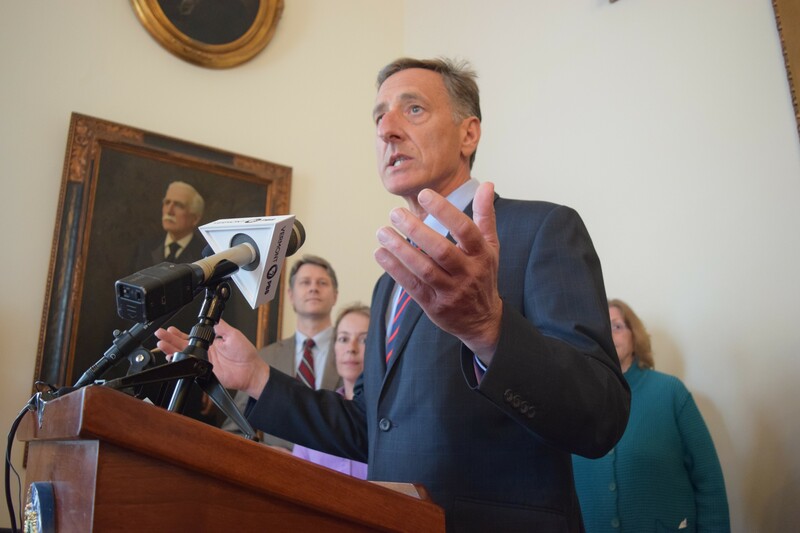 Peter Shumlin has frequently expressed his frustration with the state’s malfunctioning health insurance exchange. On Tuesday, he expressed it in more graphic terms. There was a smattering of nervous laughter and a few dropped jaws among reporters and Shumlin's own staff. But the gov kept going. “I’m at the end of my rope. I don’t think the fifth floor is high enough,” he said, referring to the location of his office in the Pavilion State Office Building. Asked later in the press conference about his choice of language, Shumlin reiterated his displeasure with Vermont Health Connect, which has never lived up to expectations since it was launched in October 2013. Half an hour after the press conference ended, Shumlin spokesman Scott Coriell summoned Seven Days back to the governor's office. Evidently, his staff members had picked their jaws off the floor and suggested he'd gone too far. “I would like to be able to retract it,” he said, perhaps not realizing that words uttered in press conferences aren't exactly retractable. Did Shumlin's assertion that he was at the end of his rope mean he was tired of being governor? No, he said. “I love this job, and we’re getting things done, but it doesn’t mean I don’t have moments of extraordinary frustration," he added. Tuesday wasn't the first time Shumlin used such language to express his frustration. Asked two years ago how much he disliked a House plan to raise $23 million in broad-based taxes, Shumlin said, "If you told me that I had to jump from a window, I would go for the highest building that I could possibly find to jump to make sure that I wasn't here to see that tax package become law."